As a book reviewer, I share the mantra of my colleagues when we say ‘we’re looking for something new’. 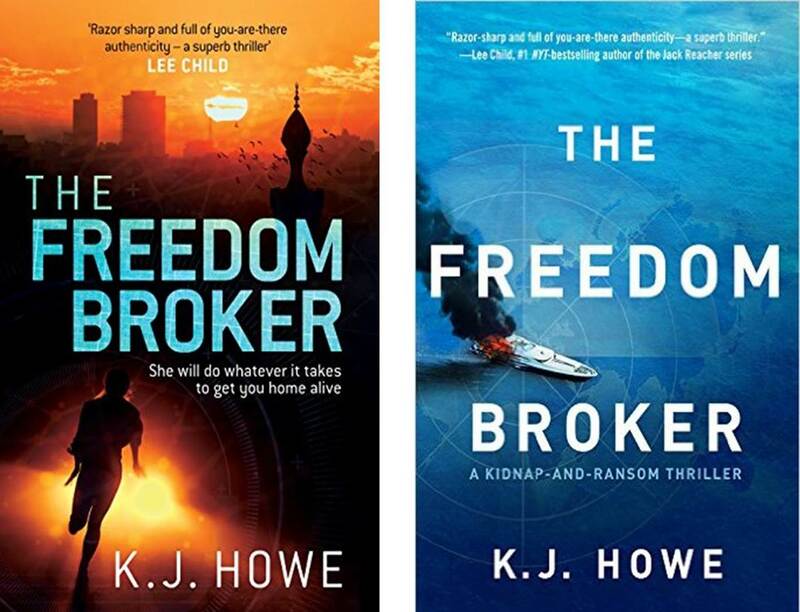 And KJ Howe’s debut thriller The Freedom Broker is just that, something different, featuring a tough, hero trapped by her past; now a hostage / kidnap negotiator and expert in ex-filtration. Filled with trade-craft, espionage techniques, as well as a vast array of characters and compassion, this action orientated thriller twisted and turned like an African river. It delves into many themes, which at times was revelatory and at times perplexing; though with Thea Paris; her confidence and that of her cohorts, one did feel a sense of reassurance that she would be able to manage despite what was thrown at her, and her team. When I put the book down, I shook it hard and listened for any rattle. There was silence, for it has been judiciously edited for in these times of reduced attention spans there was not a superfluous turn of phrase, exposition, word, or dammit - not even a stray semi-colon. Though there was an odour of Cordite remaining in the room forcing the reader to open the window. 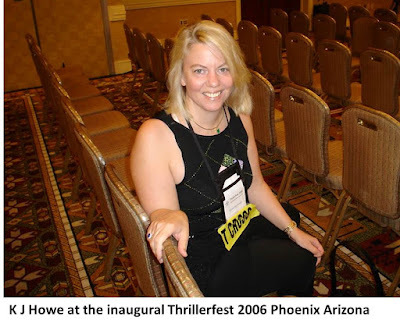 I first met Kim Howe in Phoenix Arizona in 2006, at the inaugural Thrillerfest , where by happenstance, I was seated behind her at a panel chaired by David Morrell, and have bumped into her at various Bouchercon events, as well as at last year’s Theakston’s Old Peculier Crime Writing Festival in Harrogate. 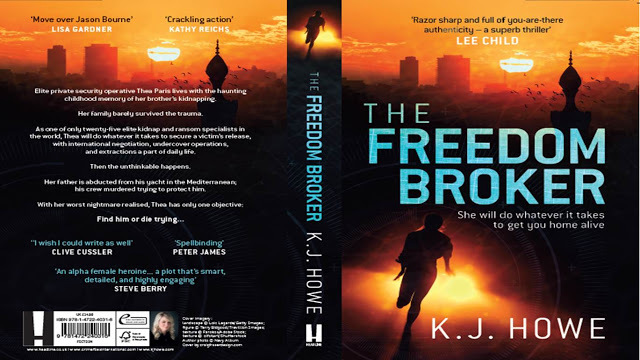 I was delighted when Kim agreed to a short interview for Shots Readers, and if this piques your interest, then don’t tarry, as The Freedom Broker is available on a promotional offer, as an ebook for £0.99 – click here, and you will be directed to the offer. AK First question first, what came first, the character of Thea Paris or the Story – or is that an unfair ‘Chicken or Egg’ type of query? KJH Thea Paris came first, but in thriller-esque fashion, the story raced to close the distance. I wanted to create a strong, talented woman with humanizing vulnerabilities, including Type 1 Diabetes. I enjoy books that are character based, so I’m hoping Thea might resonate with people, and perhaps encourage anyone with an illness that they can still reach for their dreams. Given my extensive research into kidnapping the last three years, I wanted Thea to be an elite kidnap negotiator—a freedom broker—who travels to the world’s hotspots to bring captives back home. The world of hostage retrieval fascinated me, as it lurks in the shadows of society, a heart-breaking and dangerous milieu. Thea Paris became a freedom broker after she witnessed her brother’s kidnapping as a child. While her brother returned home nine months later, he was never the same. As a result, she was determined to help other hostages. There are over 40,000 reported kidnappings every year, and the number continues to grow. Displaced military and police in third world countries are turning to kidnapping as a way of putting food on the table, and they have the requisite security skills to do so. We need our freedom brokers to help negotiate for the release of hostages to bring families back together. 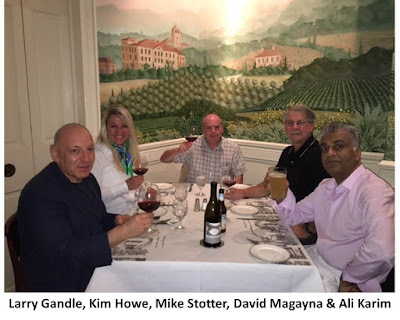 AK I recall meeting you first over a decade ago, at the inaugural ITW Thrillerfest; as an avid reader of thriller fiction, so when did the desire to write one yourself first appear? KJH It was real pleasure meeting you in Phoenix, Ali. I’m continually amazed at your memory, as you were able to literally quote what we had talked about ten years ago. I’ve always been passionate about thrillers, and when I read David Morrell’s BROTHERHOOD OF THE ROSE and Lisa Gardner’s THE PERFECT HUSBAND, I thought—wow, if I could ever provide the kind of wonderful escape these talented writers did for me to someone else, then it would be a dream come true. I started studying writing and attended Seton Hill University to complete my Master’s in Writing Popular Fiction. I’ve also studied with some of the masters in the genre, including David Morrell, Lee Child, Steve Berry, and they have taught me so much about storytelling and craft, and serve as inspiration to keep working hard. Writing is a lifelong journey, and I hope to keep improving with each book. AK And I see you have an interesting early life filled with travel and reading, so tell us a little about the books you read then, that made an impression upon you? KJH My father worked in telecommunications, so we lived all over the world, including the Middle East, Europe, Africa, and the Caribbean. It was an eclectic upbringing, providing a unique education about the diversity of our world. Always the new kid, I lost myself in books, especially spy thrillers like THE DAY OF THE JACKAL and EYE OF THE NEEDLE. I loved the adventure, danger and travel in these novels, and I never tired of those harrowing tales. I’m a bit of an adrenaline junkie. AK So with your debut, did you have an extensive plot mapped out before you embarked upon the writing process, or are you a follower of the muse - deploying the high wire act? KJH Most authors feel that they are either a plotter or a seat-of-pants writer. I’m more like pants on fire! I definitely teeter on the high wire when I write. I feel like if I’m surprised by the turn of events, then maybe my readers will be as well. I’m constantly thinking about where I want to go in the story though, trying to analyse the underlying structure. Research often fuels my plots, giving me helpful ideas. If I’m struggling with something, I consider the themes of my books, which is heavily based on family relationships. Lots of fodder! AK Many debut novels deploy the first person narrative, in terms of voice, rather than the third person omnipresent; so did you deliberate on which voice best suited The Freedom Broker? KJH I chose the third person close—for a few reasons. First, I like the way you can get inside different characters’ heads and give the readers insights into their personalities. First person only allows access into the protagonist’s viewpoint, and I prefer the variety of several viewpoints. Second, in a thriller, ending one scene with a cliff-hangar, and then diving into another character’s point-of-view is a fabulous way of injecting tension into the narrative. Third, I like the close third person, as it has attributes of the first person with its tight psychic distance, but allows for a variety of characters to speak their truth. I’m also not as comfortable writing in first person. I have the deepest respect for authors who do it well, including Lee Child who nails Reacher’s voice. AK And tell us about the research; as you subtly embed tradecraft within lucidly realised locations - so the wiff of authenticity is as strong as that of the Cordite that peppers the narrative? KJH As a former medical writer, I’m heavily invested in research, and I wanted to bring authenticity and verisimilitude to my freedom broker series. I have spent the last three years interviewing kidnap negotiators, former hostages, kidnap and ransom insurance executives, hostage reintegration experts, and the Special Forces soldiers who deliver ransoms and execute rescues. Immersing myself in this world was fascinating and critical to the books. When I read, I like to be entertained, but I also like to learn, grow as a person. I’m hoping that readers of THE FREEDOM BROKER will feel enlightened about the world of kidnapping after spending time with Thea and her team of operatives. AK I find it encouragingly curious that you attended the first ITW Thrillerfest, in Phoenix Arizona; and now over a decade later, you have not only your first thriller on the market but you are an Executive Director at International Thriller Writers and heavily involved in the NY based annual Thrillerfest, so tell us a little about what you do with ITW. KJH I’m honoured to be part of the International Thriller Writers. It’s a special organization, the sole mandate is for us to support all thriller writers. Please know that we are very inclusive, as we have many members who write YA, romantic suspense, science fiction thrillers, etc.—we welcome anyone writing page-turning fiction. I’m the executive director of ThrillerFest, the annual conference held in July every year in NYC at the Grand Hyatt. 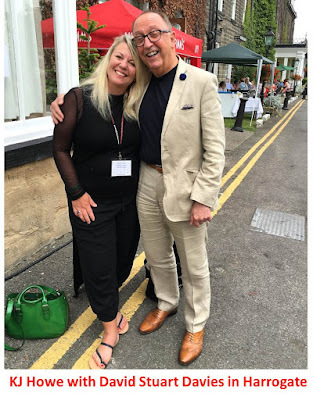 The lovely Liz Berry is the executive director of ITW, and we work closely to make sure we’re doing everything we can to help our talented authors. It’s a great privilege to be part of such a professional and friendly group. If you’d like more information, please visit the ThrillerFest website: www.thrillerfest.com. If anyone has questions, drop me a line at kimberleyhowe@thrillerwriters.org. I’m here to help. AK And will we see you at Bouchercon, Theakstons Harrogate as well - so tell us about the events you are planning to attend in 2017? AK Advanced word, including warmth for Kirkus [among others] has been very generous for The Freedom Broker, so were you nervous crossing the line from reader to writer? KJH Absolutely, totally nervous. Like other authors, I work alone for countless hours, hoping my stories might resonate with readers and critics. It’s hard to predict how people will respond. Writing is a very personal process, so any positive feedback is profoundly appreciated. I also realize that everyone has different taste, and it’s to be expected that some people may not find my book(s) their cup of tea. But when a reader or critic speaks highly of THE FREEDOM BROKER, it truly touches my heart. AK And I am assuming you are continuing the adventures of Thea Paris, and if so any hints what might be in store? KJH I was fortunate to sign a two-book deal, so SKYJACK, the next Thea Paris adventure, will be coming out next February. Thea is shepherding two former child soldiers from Africa to London when the plane they are on is hijacked. The adventures kick off from there. The novel features secret stay-behind armies from WWII, the Sicilian Mob, the CIA, and the Vatican. Warning: do not read it on a plane……..laughing……. I’m also researching future Thea Paris novels, as I have many rabbit holes to explore in the world of kidnapping. I love visiting the locales where I set the stories, so I can bring a ring of authenticity to the settings. Travel and adventure are my passions, so it’s no hardship to spend time abroad. AK I enjoy your blog, which you share with ‘ROGUE WOMEN WRITERS’ so tell us a little about it, and how it got started? 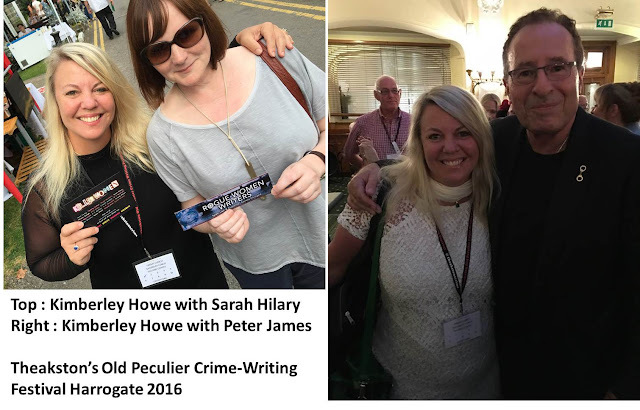 KJH I adore the Rogue Women Writers, as they are a supportive and impressive group of eight female thriller authors focused on international intrigue. Charter members include Gayle Lynds, Francine Mathews, Jamie Freveletti, Christine Goff, Karna Bodman, S. Lee Manning, Sonja Stone, and myself. A few of the ladies started talking about how fun it would be to bond together with like-minded writers, and the next thing we knew, Rogue Women Writers was born. Please stop by at www.roguewomenwriters.com, as we love having visitors. We blog regularly about intrigue, spies, kidnapping, and many other topics. AK And tell us a little about some of the recent books that have passed your reading table? KJH As you are, I’m a huge fan of Andrew Gross’ THE ONE MAN. I love books that provide a total escape, and that is what Andy did with his brilliant historical novel. If people haven’t had a chance to read it yet, I would highly recommend they do. Another phenomenal trilogy is Greg Iles’ NATCHEZ BURNING and THE BONE TREE. Can’t wait to read MISSISIPPI BLOOD. AK And I found the imagery and storytelling in The Freedom Broker to be most cinematic, so I am assuming you also have an avid interest in Film, so what recent thrillers have you seen that have caught your eye? As well as the ones in the past that still remain in your memory. KJH When I write, I often see scenes unfolding, like a movie playing on a screen in front of me—and I love watching films and TV series, especially in the thriller genre. I love classics like all of the Bond films (huge fan) as well as THREE DAYS OF THE CONDOR, DAY OF THE JACKAL, THE EAGLE HAS LANDED, RONIN, and HUNT FOR RED OCTOBER. And the TV series RAY DONOVAN is beyond compelling. I love how the brilliant writers make me cheer for a total anti-hero—and I enjoy how they use family as a prominent theme in the series. THE NIGHT MANAGER had me absolutely hooked—but that could have been because of Tom Hiddleston. Also love HOMELAND. AK Thank you for your time, and also the adrenaline rush of your debut thriller. KJH Thanks for your energy, your positivity, and your support of the genre. I always enjoy your posts, the analysis thought-provoking, staying with me long after I read them. AK You are way too generous, and we look forward to seeing you at this year’s Crimefest in Bristol.